Eminent film-making masters Nagesh Kukunoor, Amol Palekar, Niranjan Iyengar, Manish Jha, Dolly Thakore and Paromita Vohra spent their day at FX School to kick off the screening of over 70 entries for the 48 Hour Film Project, an international film-making competition franchise. Their mammoth task: to judge the work of students and professionals alike in a unique competition that put filmmakers to the test. FX School, with its state of the art technology and equipment, was chosen as the venue for jury screenings. 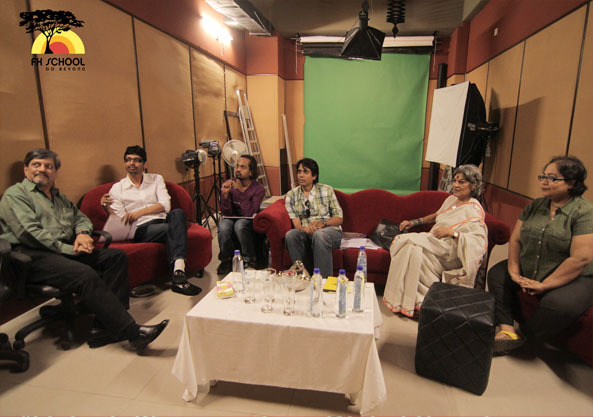 Judges assessed the entries from noon till late that night in one marathon session in the studio on FX School’s campus at Andheri (W) in Mumbai. The 48 Hour Film Project invited budding filmmakers from all over the country to participate in a race that pushed their creativity and team cohesiveness to create a short film over a 48 hour time period. In addition, each team was provided with a genre, a character, a prop and a line of dialogue that had to be included in their films. With these restrictions and the limited time, contestants were challenged to use the cinematic medium and collaborate in the creation of one final product, complete with editing, visual effects and graphics as well as audio. FX School, a pioneer and leader in the education and training of Digital Filmmaking, Visual Effects, Animation and Digital Photography, was the natural choice for a partnership with the 48 Hour Film Project. FX School's commitment in training students to recognize and uphold the aesthetics and language of modern cinema and promote good cinematic storytelling while using technology to create better films is a vision it shares with 48 Hour Film Project.